By planning and acting early you can avoid fatal and potentially dangerous situations for your pets. Although individual needs vary, we have developed a comprehensive kit that will assist you so you are ready to go in case of an emergency. Who can I contact if my pet gets lost? If your pet is lost in an emergency please contact our shelter or Domestic Animal Services. What about livestock, horses or other large pets? ACT Emergency Services Agency have plenty of additional information to help those who own horses and livestock in case of an emergency. You can access the site here. Where can I view updates in case of an emergency? In case of emergency you can follow the ACT State Emergency Service website for any updates or news. What happens if I need to visit an after hours vet? There are a couple of after hour vet clinics. We recommend you search for your nearest out of hours vet online. Where can I purchase a pet first aid kit? Pet first aid kits can be purchased from our shelter located at 12 Kirkpatrick Street, Weston Creek. Does leaving behind the door hanger guarantee that emergency services will evacuate my pets for me? No. 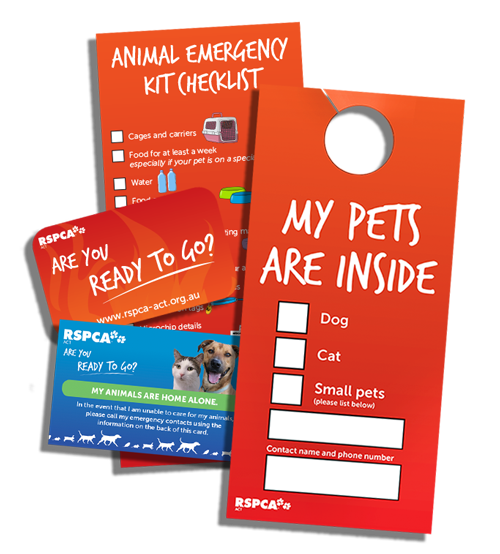 Emergency services will always have to prioritise their work, but it doesn’t hurt to let others know that your pets are inside.